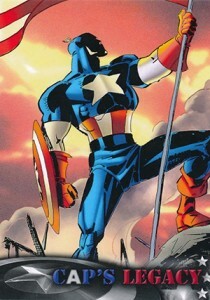 The Marvel blockbusters keep on coming. 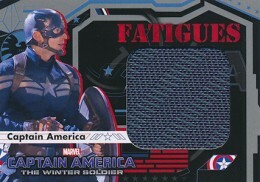 2014 Upper Deck Captain America: The Winter Soldier is the latest in a string of movie releases for one of Hollywood's most lucrative franchises. 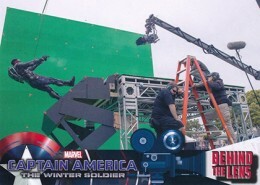 The configuration as some of Upper Deck's previous Marvel movie sets like Iron Man 3 and Thor: The Dark World. Each hobby box comes with two memorabilia cards as well as either an autograph or sketch card. 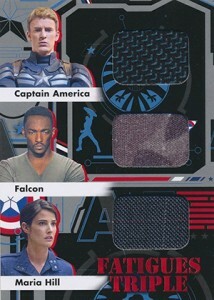 The 2014 Upper Deck Captain America: The Winter Soldier base set has 72 cards. Images are among the earliest released for the film. The set comes with three levels of foil parallels: Silver (1:2 packs), Red and Blue. Collectors can also find randomly inserted Printing Plates (1:144 packs). 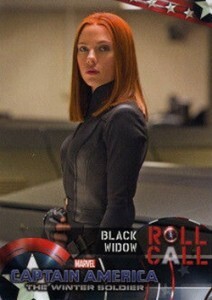 The characters of the film are the focus of 18 Role Call cards. These come with similar Silver, Red and Blue Foil parallels. Costume and Prop Cards have as many as three swatches in them. Single-memorabilia cards are one per box. Two- and three-piece cards are each inserted 1:42 packs. 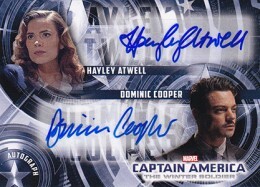 2014 Upper Deck Captain America: The Winter Soldier includes autographs from both the film's stars and creators who have worked on the comic book. 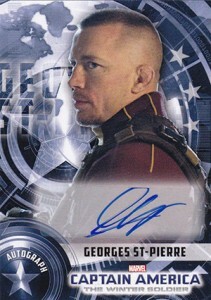 Actor Autographs fall 1:200 packs. There are also Dual Autographs (1:720 packs) and Autographed Memorabilia Cards (1:480 packs). 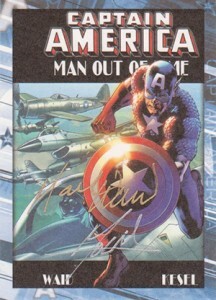 Comic creator signatures come in the form of Classic Cover Autographs (1:60 packs). 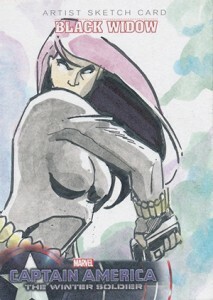 The release has three types of sketch cards, which feature original artwork done directly on the card. Vertical Sketch Cards are the most common (1:60 packs). There are also Horizontal Sketch Cards (1:120 packs) and Character Sketch Cards (1:120 packs). Manufactured Patch Cards make a return. 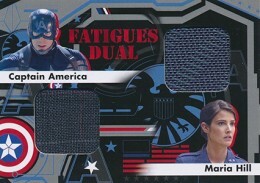 Upper Deck also used them in their set based on the first Captain America film. These highlight some of the military insignias used in the film. 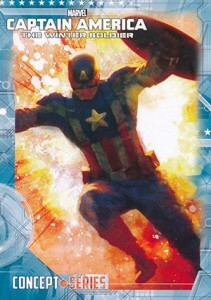 Basic inserts in 2014 Upper Deck Captain America: The Winter Soldier include Cap's Legacy (nine cards, 1:5 packs), Concept Series (18 cards, 1:2 packs), and Movie Posters (nine cards, 1:5 packs). CAPTAIN AMERICA THE WINTER SOLDIER JUGGERNAUT SKETCH BY ? Hey Ryan! Is there gonna be more info on this product???? 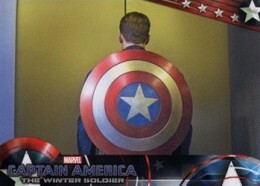 Captain America the winter soldier??? Like odds or print runs???? Fran da man � If we get it, we’ll post it. 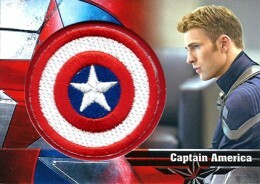 Is there a Chris Evans Autographed Memorabilia card? I have seen a picture of it but I can not find or confirmed of its existence? John Trinh � No there isn’t. The was a mock-up of a potential card in early sales materials but that’s all.